UPDATED: Wed., March 7, 2018, 9:45 p.m.
TOPEKA, Kan. – Firefighters are battling dozens of wildfires in Kansas and Nebraska that have erupted since the weekend, even as calmer winds on Wednesday helped contain or extinguish most of them. In Nebraska, a burned man was found crawling in a McCook farm field Tuesday afternoon as 50 mph wind gusts whipped flames down a ravine toward the Red Willow County community of 7,500 people. The man, who had camped out in the area, has been transferred to a burn center. Kansas authorities said 50 fires have burned about 40 square miles. 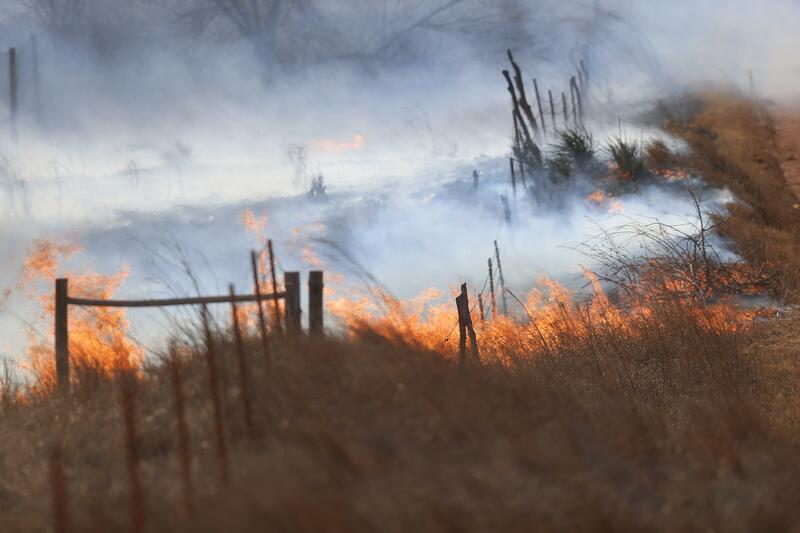 Improving weather conditions Wednesday left crews in 13 Kansas counties fighting blazes that are contained or almost out. But a blaze that broke out Wednesday near Hamilton in Greenwood County prompted the Kansas Army National Guard to send six Black Hawk helicopters to assist with the firefighting operations. This year’s wildfire outbreak in Kansas pales in comparison to March 2017 when some 2,000 firefighters battled a series of blazes that consumed more than 1,000 square miles, killed a truck driver, forced thousands to evacuate, and damaged or destroyed dozens of structures. Thousands of cattle also died. Kansas Gov. Jeff Colyer said the state has learned a lot in the last couple years. The governor attributed the successful efforts this year to improvements in coordination between state and local emergency responders. In southwest Nebraska, crews were dispatched to eliminate dangerous hot spots left by a wildfire that destroyed a house and blackened hundreds of acres as it threatened McCook. As officials called for evacuations, students and staff at McCook Elementary School were taken to McCook Senior High School several blocks away. People at the state prisons’ Work Ethic Camp spotted the fire and reported it to local officials around 1:20 p.m. Tuesday, but camp spokeswoman Cristy Schwartz said the 189 inmates and nearly 50 staffers didn’t have to leave the grounds. Chief Bill Elliott of the Red Willow Western Rural Fire Department said wind gusts knocked a power line into a shed about 2 miles from town, and sparks from the resulting short ignited dry brush below. The blaze never entered the city proper, but the flames did destroy a house on the edge of town while the residents weren’t home, Elliott said. “The house right beside it – only 30 feet away – was not damaged,” he said. Published: March 7, 2018, 1:17 p.m. Updated: March 7, 2018, 9:45 p.m.